Our thoughts are with those clients and their family members who have been impacted by this past month’s hurricanes in Texas and Florida. This month we examine some of the economic impacts of these storms and their historical context. These past several weeks have brought some of the most intense weather our country has ever seen. For the first time in recorded history, two category 4 hurricanes made landfall in the continental U.S. less than a month apart. Hurricane Irma was the strongest storm ever recorded in the Atlantic Basin with sustained winds of 185 miles per hour, while Hurricane Harvey dropped two feet of rain on Houston in the first 24 hours. As residents return to the Florida peninsula, it appears that a last-second westward shift of the storm spared the more populated and economically vulnerable Miami area from the direct hit that seemed imminent in the days leading up to landfall. That fact is of little solace to those residents who did lose everything in some of the hardest hit Keys and Atlantic islands. Harvey did not make any such move and the Houston metro area bore the full brunt of an incredibly slow-moving hurricane. 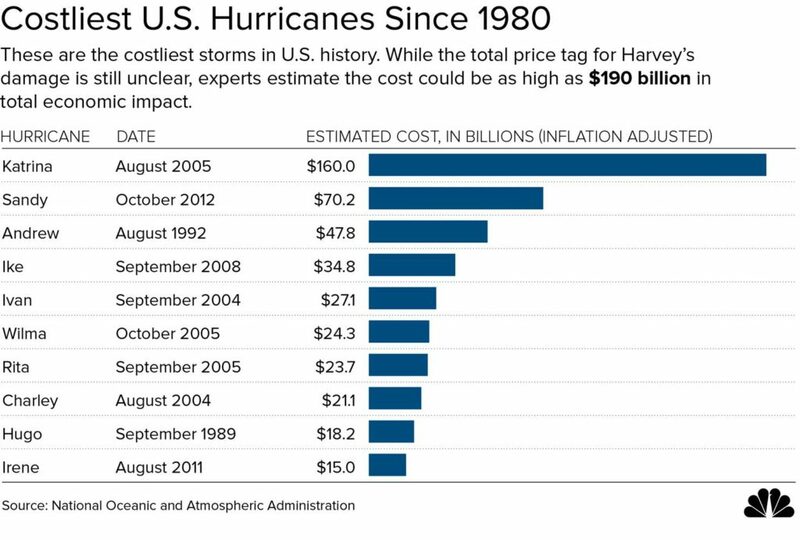 While the economic impact of Irma has been revised down recently, the latest estimates from Harvey indicate that it will likely be one of the top three costliest natural disasters in U.S. history. The total price tag for Hurricane’s Harvey and Irma will not be known for some time, and current estimates vary widely. Moody’s estimates put losses between $45-65 billion for Harvey, while AccuWeather suggests the costs could rise to $160 billion. The average estimates put the combined damage from both Harvey and Irma at around $70-100 billion. Houston is the country’s fourth largest city with 6.6 million residents and if it were a country, would be the world’s 23rd largest, exceeding the GDP of both Poland and Sweden. On September 1st, a third of the city was underwater. Goldman Sachs estimates that up to 16% of the nation’s oil refining capacity was shut down during the first two weeks of September, and the storm could drag 3rd quarter GDP down by up to a quarter of a percentage point. Up to 30,000 homes and in excess of 500,000 cars will be categorized as total losses. These dips in GDP from natural disasters often prove transitory however, and the corresponding boost from rebuilding tends to offset losses in most cases. Additionally, while the regional economies historically have shown disruption following large storms, the national economy is generally resilient in the face of localized disasters. 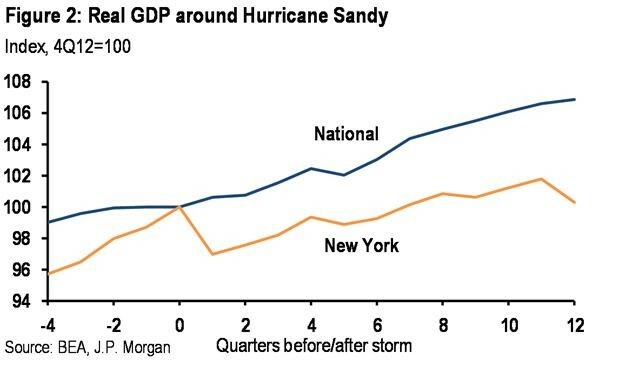 In 2012, New York’s economy suffered because of Hurricane Sandy, but the national economy did not. A similar pattern was seen in 2005 after Hurricane Katrina. 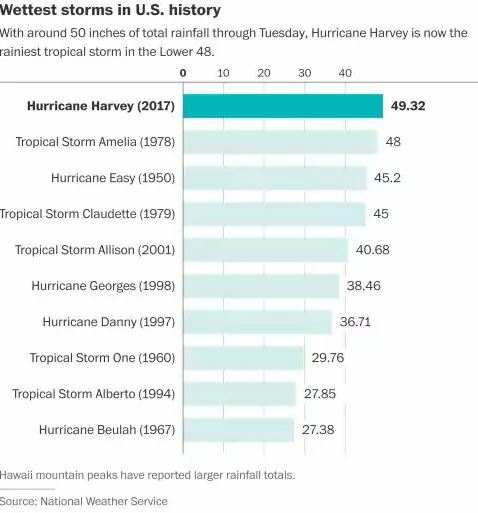 With all the superlatives being thrown around, there is one category where Harvey will undoubtedly rest in the number one spot, that being rainfall totals and sheer volume of water dropped on land. 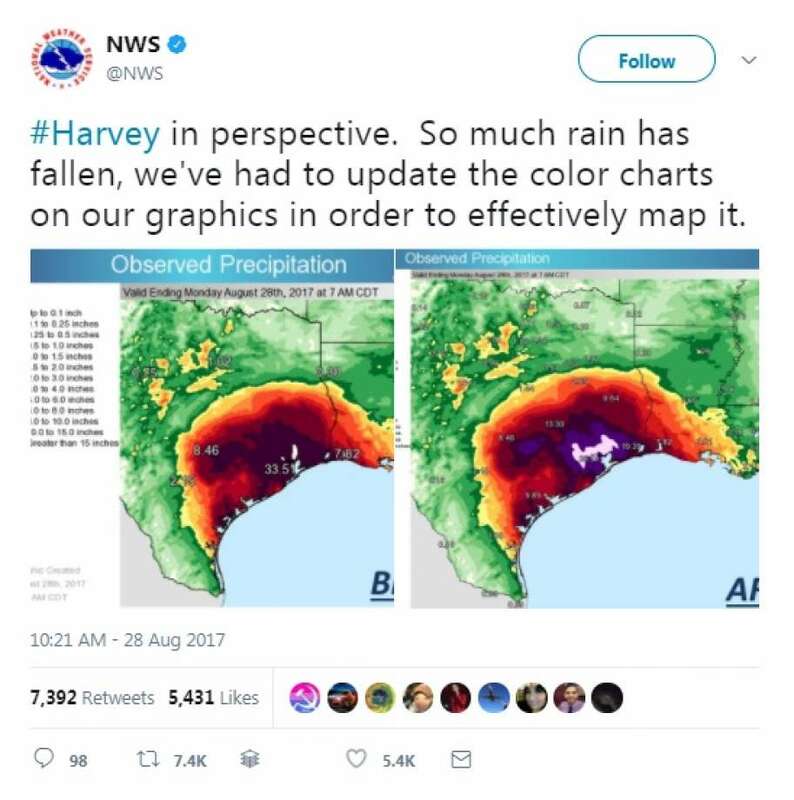 So much rain fell in Houston, that the National Weather Service had to update the color coding of their rainfall maps to properly depict the totals in some areas. The slow-moving nature of Harvey caused it to remain over the same area for days on end, making three separate landfalls in the Houston area. It is this aspect of the storm that may prove to be so devastating for the people of Houston. Analytics firm Corelogic estimates that of the $25-37 billion in flood losses expected from the storm, less than 30% of that amount is covered by insurance. By comparison, about 50% of the losses in Hurricane Katrina were covered. This is because much of the Houston area falls outside of what the federal government deems flood zones, where flood insurance is not mandatory for homeowners. 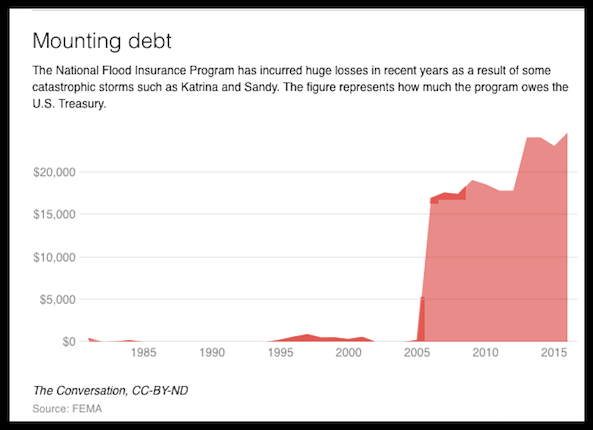 The program has incurred large losses in recent years because of Hurricane Katrina and Hurricane Sandy. The program does not take in nearly enough to pay for itself in the face of costly storms like we have seen over the past decade. These were not the first storms to wreak havoc on our country, and they will certainly not be the last. Despite the tremendous damage, the people of Texas and Florida will rebuild and our economy has shown to be remarkably strong in the face of these types of disasters, which we expect will continue to be the case. 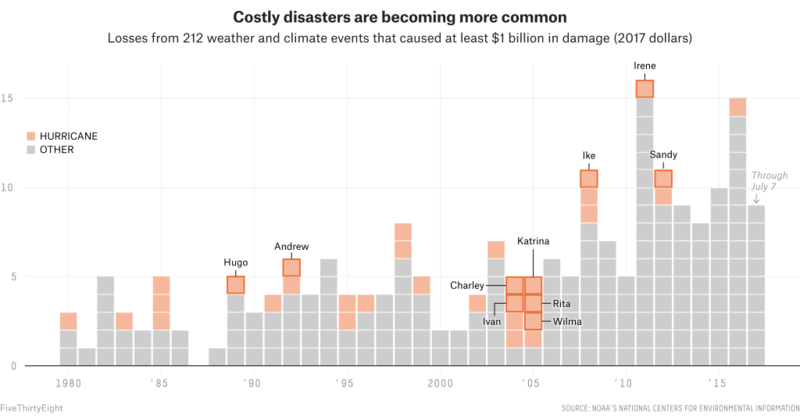 Accelerating economic development in previously undeveloped areas, asset appreciation, and an increase in the frequency and intensity of natural events is creating an obviously upward sloping trend line in $1 billion or more damage events.